There’s nothing that beats living it up outdoors when the weather is good and you’re as free as a bird. As it so happens, our friends in MSR – Mountain Safety Research, have given us a great prize worth over €400.00 of an Elixir one tent and a Windburner Duo stove system. M.S.R. has been around since 1969 when Seattle engineer and lifelong mountaineer Larry Penberthy formed the company as a one-man crusade dedicated to improving the safety of climbing equipment. The fuel behind Larry’s passionate fire was a simple belief that still drives their team today: “The idea that better, safer, more reliable equipment is the key to unlocking greater adventures.” From that notion evolved a pioneering outdoor company whose innovations have revolutionized the way people experience the outdoors worldwide. Today, they’re a close-knit team still obsessed with designing the most reliable, high-performance gear possible, using their knowledge of engineering and science to find better solutions to the challenges of the mountains. We here at Great Outdoors are huge fans of the brand and only wish we could stock more of their fantastic designs and some of us are very disappointed that we can’t enter this giveaway. Read on below and answer a simple question for your chance to win. 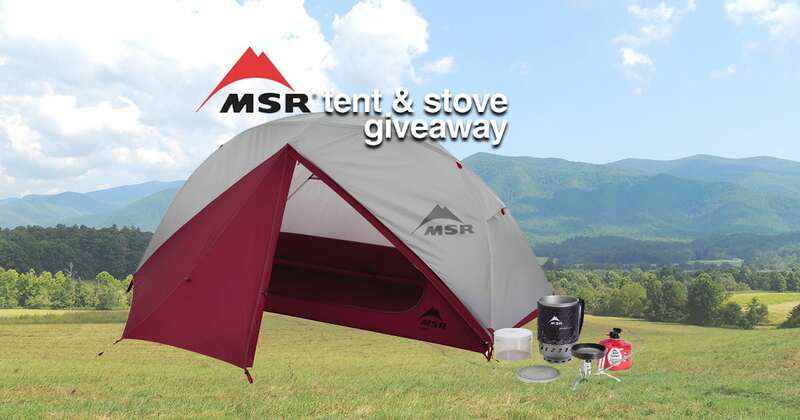 The following are the terms and conditions of the Great Outdoors MSR Tent & Stove Giveaway 2018. •Your participation in the competition shall be deemed to be your complete acceptance of the terms and conditions herein. •All entrants will have their email address added to our mailing list and that of MSR. To unsubscribe in the future, simply use the unsubscribe link in any of the emails you receive. •The winner will be notified via email and prizes must be collected in-store within 30 days of their entry or the prize will be considered forfeit and used in an alternative competition in the future. •Great Outdoors’s decision is final with respect to all matters relating to awarding of the prizes and shall not be subject to review or appeal by any entrant or by any third party. •The winners will be announced via social media channels on Friday, August 31st. •Closing date for all applications is midnight on Thursday, August 30th 2018.•Specification of prize may vary. Images used for illustrative purposes only.